We hear a lot in the news these days about drones; how they're used to scout out battlefields, spy on celebrities, be drunkenly piloted onto White House lawns, etc. We hear so much in fact, that it's hard to remember that they actually have non-controversial uses. Take within the construction industry, for example. Some large construction firms have already begun to utilize these unmanned flying machines on various projects. Among them are AECOM, DPR, Becthel, and French company Bouygues. Drones undeniably are both great fun to watch and operate, but do they truly have any practical applications for our industry? It should be noted that at the moment, given the drones' technology limits (they can be effectively airborne for short amounts of time) and often remote construction sites, the best use of them is photography. 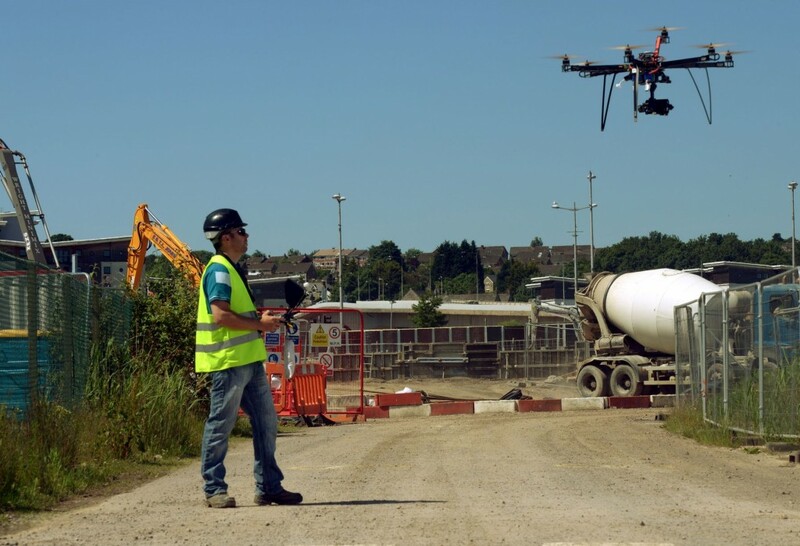 Drones in construction can be quite useful in transversing a potential construction site, taking multiple pictures that can be combined into one large aerial view. Surveyors and engineers now commonly use satellite photographs for surveying purposes, but drone-shot photos are taken in real time. No need to wait for updates. These images can also go to web-based platforms, meaning many firm employees and clients can have access to them. Being able to view sites remotely means that fewer physical trips have to be made to a site, cutting down on costs. Other applications of this construction drone photo technology are cutting down on gridlock at big projects, and spotting safety issues and other problems on sites. Saving time in terms of prep work, meetings, conducting inspections, and heading off site problems before they happen all by just looking at some photographs? That means firms can take on more projects more quickly! It's time to go drone shopping! But before rushing off to "Drones R Us", there are some things to consider. While the typical hobby shop drone retails at about $100, the type that would need to be used at construction sites averages at closer to $1,000. Factor in wireless data transfer and high resolution photo ability, and users could be adding several thousand dollars more to the price tag. This bird's eye photography has raised some legal concerns about employee and public privacy. And because drones are considered aircraft, the FAA has gotten involved. The agency is in the process of issuing official regulations on the technology's civilian use, which should go into effect sometime this year. But while drones are not a common on-site presence yet, that day is coming. Managers and supervisors should take advantage of the calm before the coming drone storm to decide now how this technology can best be utilized for their needs.